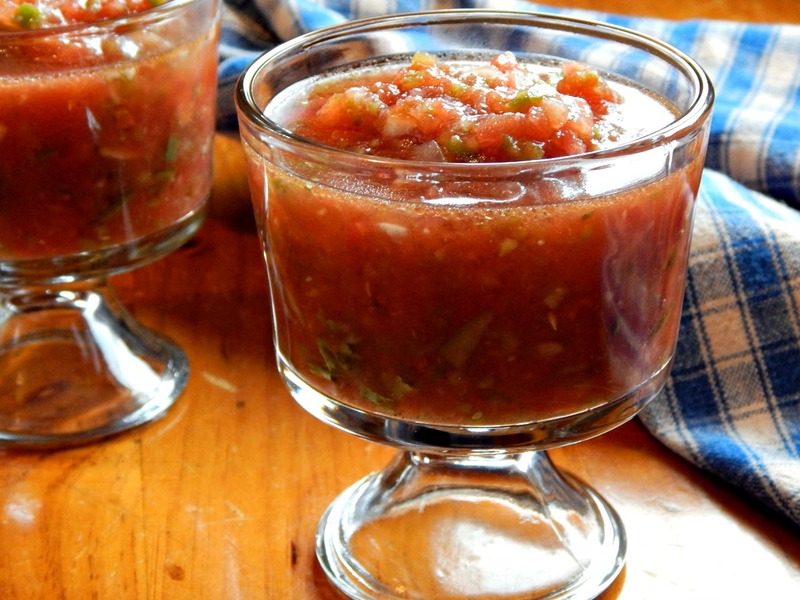 During the heat of summer, I can hardly think of a better meal than Classic Gazpacho. Cool and refreshing, this Gazpacho gets a bit of richness from the olive oil, a good tang from the vinegar and just the faintest touch of heat from a little jalapeno. This is a super clean, no bread recipe, and I practically crave it! Seriously, when I used to bring this to lunch for work, I’d often have it finished in the morning! The beauty of Gazpacho: Fresh ingredients, super healthy and super delicious – plus you can customize to your own taste. While this, as written, is a super easy food processor version, you always have the option of changing it up a bit. The Gazpacho can be pureed and just a few nicely chopped vegetables can float on the top for a more elegant look. If your preference is for a Gazpacho with bread, go ahead and add a few slices (without the crust) and it’s still wonderful. If you’d like, puree the soup and float a few croutons on top, or just serve it as I like to, with my Crusty Bread. Actually, I have a hard time imagining this soup without that wonderful bread! It makes a lot of sense, when making Gazpacho, to make it seasonally and use the lowest priced, good tomato at the market. This is a case where canned just won’t do, and neither will an olive oil that is mediocre. If you have a good bottle around for drizzling, this is the recipe to use it in. You may want to plan to make extra – it’s so good, you may very well find yourself pulling it out for your morning break, too! For the texture show, finely chop, but do not puree, all ingredients, in batches in a food processor. Stir well and refrigerate for at least two hours to blend the flavors and chill. Serve well chilled. To easily blanch tomatoes and prepare for gazpacho: Using a large pot, bring water to a simmer. Cut an “X” in the top and bottom of the tomato and drop in the water for about a minute. The skin will recede just a bit when they are ready. Watch carefully – the tomatoes will taste freshest if removed before they begin to cook. Immediately place in ice water to stop the cooking process. Peel over a strainer in a bowl to catch the juice. Push and work the seeds against the strainer to extract the most juice possible. Garnish with additional chopped vegetables, a drizzle of vinegar or olive oil, croutons or cooked shrimp. If it’s just family, I often don’t peel, seed or core, depending on the tomato. If there are a ton of seeds I take them out. I figure it’s all good for you. Many of the “discards” for this recipe can be used – consider adding peels and seeds (well scrubbed if using the cucumber) in a Green Smoothie or use them to flavor Spa Water. There are many, many versions of Gazpacho – they vary from place to place, family to family and season to season. Make this at home to suit you by varying the ingredients. Use a little hot sauce or red pepper if you don’t have jalapeno. Vary the vinegar for a different taste. Consider adding additional flavor to your Gazpacho by flavoring it like a Bloody Mary with Worcestershire and Tabasco, perhaps with a jigger of Vodka tossed in. If you’re a seafood fan, consider using Clamato and adding a little shrimp to the garnish. Gazpacho can easily take on a Mexican flair: Increase the jalapeno, add a little red onion and lime and garnish with Avocado. Some recipes use bread – I prefer the clean taste of the vegetables, with maybe some croutons on top – that, of course, doesn’t mean I’m right! If you want a thicker version, add in torn up bread. The No Knead Crusty Artisan Bread is perfect for this recipe, and makes great croutons, too. Only minutes of hands-on work, it does need to be mixed up the day before: bonus – about a quarter to make. The other main variance is in the texture – my recipe is quick and easy, done in the food processor. You can certainly puree your vegetables until they are basically juice and then add in a few finely chopped vegetables for a garnish. All the vegetables could be hand diced and floated in the soup, instead. Use a coupon matching site! Do not discount the savings! I check a site every week, even if I don’t “need” to go to the store and often find bargains I can’t pass up. This entry was posted in Click here for Bargain Meals, Click here for Fabulous Food Posts and tagged Bell Peppers, Cucumber, Easy Recipe, Frugal Hausfrau, Gazpacho, Soup, Tomatoes, V-8, Vegetarian Meal. Bookmark the permalink.